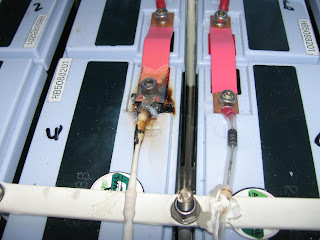 Malcolm Faed's Blog: Mental Note, Check the battery terminals! It would seem that I did not have one of the battery terminals tight enough. The battery still tests OK, but I have replaced it and the balance circuit with some spares. Mal, hopefully, this will not repeat gain, do you think it was because of road vibration or just a mistake during install phase? Btw. what is your current charge cyclus on these batteries, still in the early brake-in 20-50 charges area? I am not sure why the terminal overheated as I am careful about tightening them It may be that I forgot to tighten it properly or maybe there was a bit if swarf or a jager preventing the strap from connecting to the terminal properly. I use spring washers to prevent the screws from vibrating loose. I am probably up to about 15 cycles. Average about 1 trip per day of between 5km and 20km, and 35km once per week.